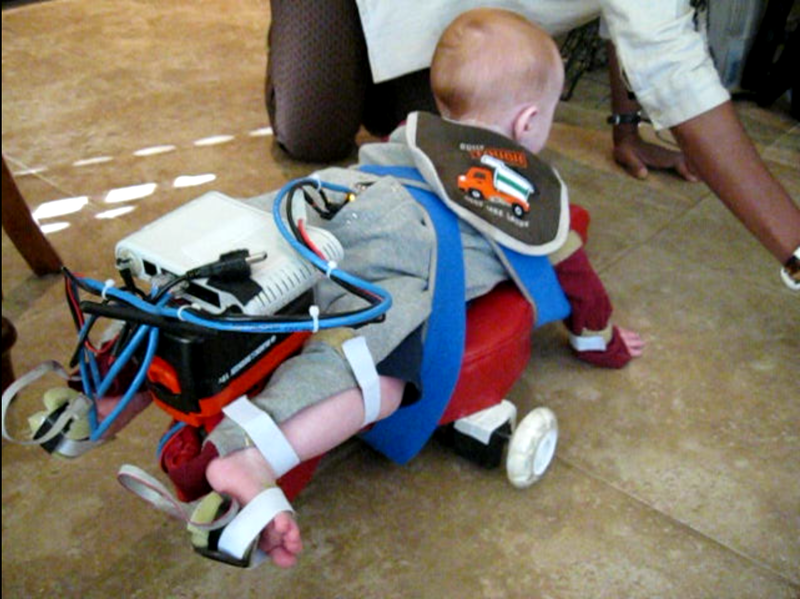 Effective robotic assistance of infants with or at risk of developing Cerebral Palsy (CP) has the potential to reduce the significant functional limitations as well as the potential deficits in cognitive development. This project focuses on the development and testing of 1) a sequence of robotic assistants that promote early crawling, creeping, and walking, and 2) a model of infant-robot interaction that encourages the continued practice of movement patterns that will ultimately lead to unassisted locomotion. Typically developing infants initially learn to crawl through the generation of spontaneous limb and trunk movements. Early in the process, these spontaneous movements transport the infant across the floor. The rewarding locomotory experience drives the infant to refine the movements to intentional and exploratory skills. Ultimately, the infant intentionally engages these skills to solve larger problems, such as obtaining an interesting toy or exploring their environment. Infants with conditions such as CP lack the muscle strength, postural control, and motor coordination necessary for these early exploratory limb and trunk movements to result in locomotion. Without this positive feedback, the development of the neural pathways for productive limb use is diminished, which results in delayed or lack of development of crawling and walking. These limitations in mobility negatively affect other domains of development such as perception and cognition, with effects being visible even into adulthood. Ghazi, M., Nash, M., Fagg, A. H., Ding, L., Kolobe, T. H.-A. and Miller, D. (2015) Novel Assistive Device for Teaching Crawling Skills to Infants, Proceedings of the 10th Conference on Field and Service Robotics, Electronically Published (paper #58). Kolobe T. H.-A., Fagg, A. H., Pidcoe, P., Williams, P. (2015) Effectiveness of Reward- and Error-Based Movement Learning in Enhancing Self-Initiated Prone Locomotion in Infants with or at Risk for Cerebral Palsy. Proceedings of the The World Confederation of Physical Therapy Congress. Abstract A-613-0000-03707. Singapore. May. Selected as a State of the Art Presentation and awarded the Outstanding Platform Presentation Award. Kolobe T. H.-A., Fagg, A. H., Pidcoe, P., Brown, D., Bulanda, M. and Rauh, L. (2015) Development of prone locomotion in infants with or at risk for cerebral palsy. Appears in the Combined Section Meeting Conference of the American Physical Therapy Association, Indianapolis, February. Cox P. J., Kolobe T. H.-A., Fagg A. H. and Schmiedeberg T. (2015) Prone Locomotion in Infants With Down syndrome using the SIPPC: A Pilot Study. Appears in the Combined Section Meeting Conference of the American Physical Therapy Association, Indianapolis, February. Kolobe T. H.-A., Fagg A. H. and Ng, Y (2014). 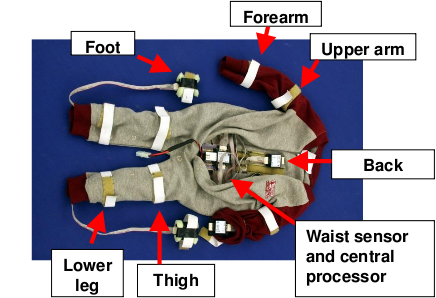 Comparison of the effect of robotic reinforced movement learning technology on the development of prone locomotion in infants with and without risk for cerebral palsy,. Appears in the Annual Meeting of the Child Neurology Society, Columbus OH, October. Kolobe, T. H.-A., Fagg, A. H, Pidcoe, P. and Miller D. (2014) The effect of robotic reinforced movement learning technology on the development of prone mobility in infants at low and high risk for cerebral palsy. Appears in the Annual Meeting for the Society of Neuroscience, Washington DC, November.